Angel hair pasta can’t be weighted down with a heavy sauce. Here it is dressed with olive oil and garlic, and topped with cherry tomatoes and fresh basil. The recipe, from Barilla Pasta, is below. Chefs know—but many home cooks don’t realize—that there’s a reason certain sauces don’t work with certain pastas. Fragile pastas like angel hair can’t be weighted down by heavy ragùs. By the same token, robust penne and shells need more than a dressing of olive oil and garlic. Barilla, producer of America’s number one brand of pasta, has developed this easy-to use chart that explains it all for you. Now, you’ll know why you never see certain pairings on restaurant menus. In fact, certain cuts of pasta were developed in their regions to accommodate the cuisine—seafood sauces, meat sauces, etc. Spaghetti. Long and thin, yet not too fine, spaghetti becomes brisk and graceful after cooking and is one of the most versatile shapes. Everybody’s favorite, spaghetti pairs well with just about any kind of sauce. 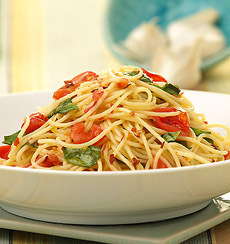 For the more refined and delicate spaghettis, use seafood-based sauces (like tuna) or oil-based sauces. Angel hair. Light structured sauces work best to balance the delicacy of this long shape. Jumbo Shells, Lasagne, Manicotti. These famous baking shapes are known for their generous consistency and heartiness, allowing for use with the most robust and highly flavorful sauces and the most sumptuous and creative fillings. Sauces can be rich in chunks and abundant with moisture to facilitate oven-baking. Lasagne, the most well-known pasta al forno, varies from region to region—Tuscans and Emilia-Romagnans make it with a béchamel, a meat ragù and grated Parmigiano; Ligurians make it with pesto. Ditalini, Orzo, Pastina. Known for being served in children’s soups throughout Italy, these very delicate shapes (pastina) are great with light vegetable, meat or fish-based broth soups. • Heartier soups like vegetable soups with peas and lentils are perfect for these more substantial soup shapes. • They’re also great with cream-based soups. The thickness of these shapes requires full flavor sauces. The large diameter, combined with the ridges that penne and rigatoni bring, make them ideal to retain sauces on the entire surface, inside and out! Prep time 15 minutes, cooking time 13 minutes. Heat olive oil in a skillet. Peel and gently press the garlic. Add garlic and pepper flakes to the skillet. Cut the cherry tomatoes in half and tear the basil into small pieces. Add the cherry tomatoes and basil. Simmer for five minutes. Season with salt. Discard the garlic cloves. Cook the pasta according to package directions. Drain and toss with the sauce. Garnish with freshly-grated Pecorino Romano. 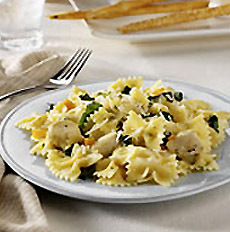 Everyone delights in bow tie pasta (farfalle). This “meaty” recipe has chunks of chicken, plus iron-rich spinach. Prep time 15 minutes, cooking time 30 minutes. Sprinkle chicken with 1/2 teaspoon salt and 1/8 teaspoon black pepper. Heat oil in large skillet over medium-high heat. Add chicken, onion, pepper and garlic; cook and stir 5 to 7 minutes or until chicken is almost cooked through. Add chicken broth, spinach and remaining salt and pepper. Cook until spinach is wilted and chicken is cooked through. Cook farfalle according to package directions; drain and return to pot. Add chicken mixture to hot farfalle; toss. Transfer to serving platter; sprinkle with cheese and parsley. Makes 4 to 6 servings.